Hawaiian food has been a genre left untouched in the Portland area…until now. 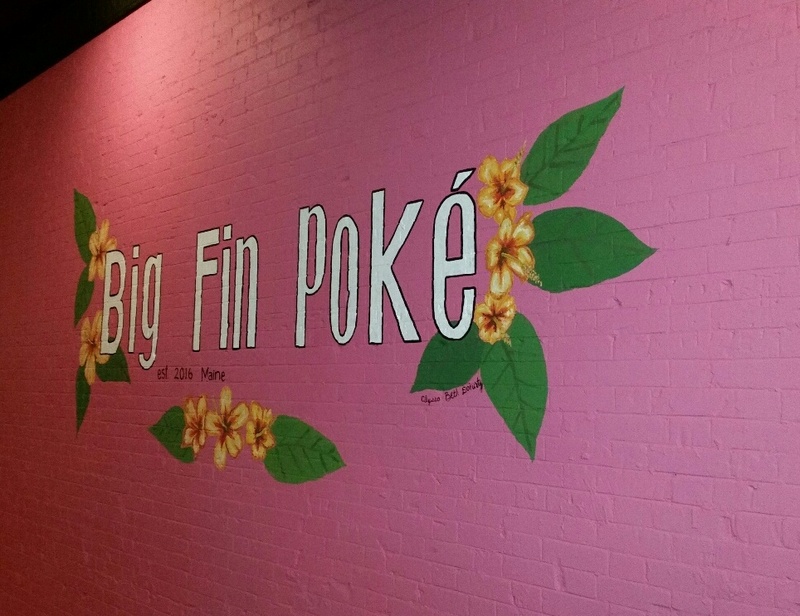 Big Fin Poke (pronounced po-kay) on Main St. in Westbrook, offers the first look at the previously unheralded food that many local residents have seen. Opening at the end of December and offering “Hawaiian style sushi”, the restaurant creates an interesting niche all by itself while filling in a space just outside the big city that could use a little more food life. Knowing that it was a casual, counter service restaurant and maybe a healthier choice than most, it seemed like the right place to eat so we didn’t have to spend a lot of time fussing with menus, table service, and heartburn. We headed over and also made last minute plans for a friend to join us there. It took a while, but we found a parking space in the public parking area behind the buildings across the street and made the walk over. My first impression of the joint upon entering was that it was both lively and colorful. With a big pink logo’d wall on the right and a giant colorful menu behind the counter, I was primed to learn about the Pacific provisions. While waiting in line to get to the counter and get a better view of the menu, we passed the drink cooler and picked out some waters. Once we got to the front, there were decisions to make. 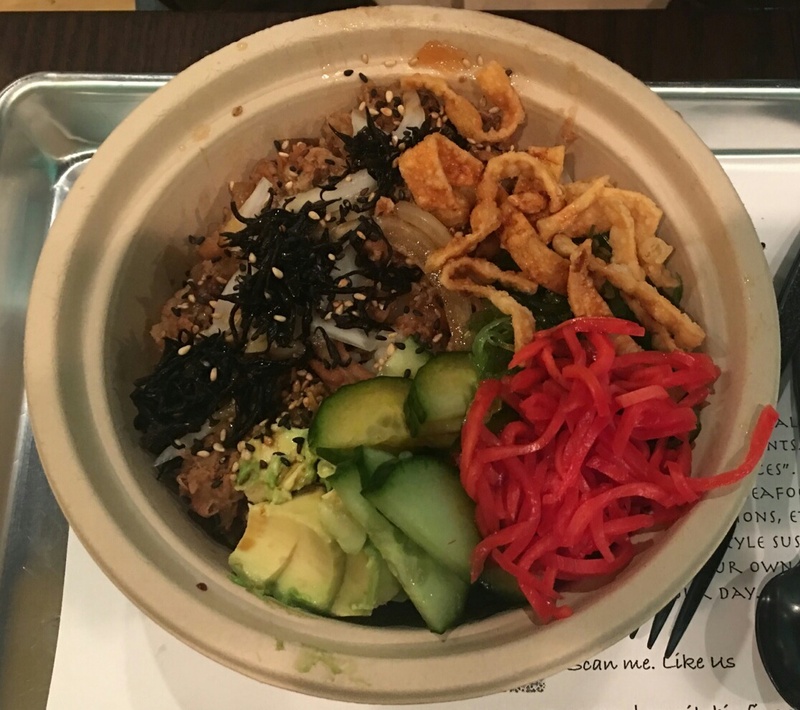 I had to decide on a bowl with rice, a salad bowl with romaine, or a pokiritto with rice in a seaweed wrap. I chose the rice bowl and took the large over the small. Next, I had to choose if I wanted to order one of the BFP “favorites” – predetermined combos to make life simple – or create my own. I thought it would be fun to create my own. I went with brown rice and for proteins, I avoided the raw fish, instead choosing beef, chicken, and tofu since the large bowl came with up to three. For sauce, I kept it simple with the Big Fin Shoyu. The tougher choices with lots more options came last. For mix ins, I decided to go with cilantro, jalapeno, and green onion. As toppings I chose kimchi, seaweed salad, and crab salad. For crunch, I got crispy onion, crispy garlic, and wasabi peas. After all that, I accepted the offer of sesame seeds on top. 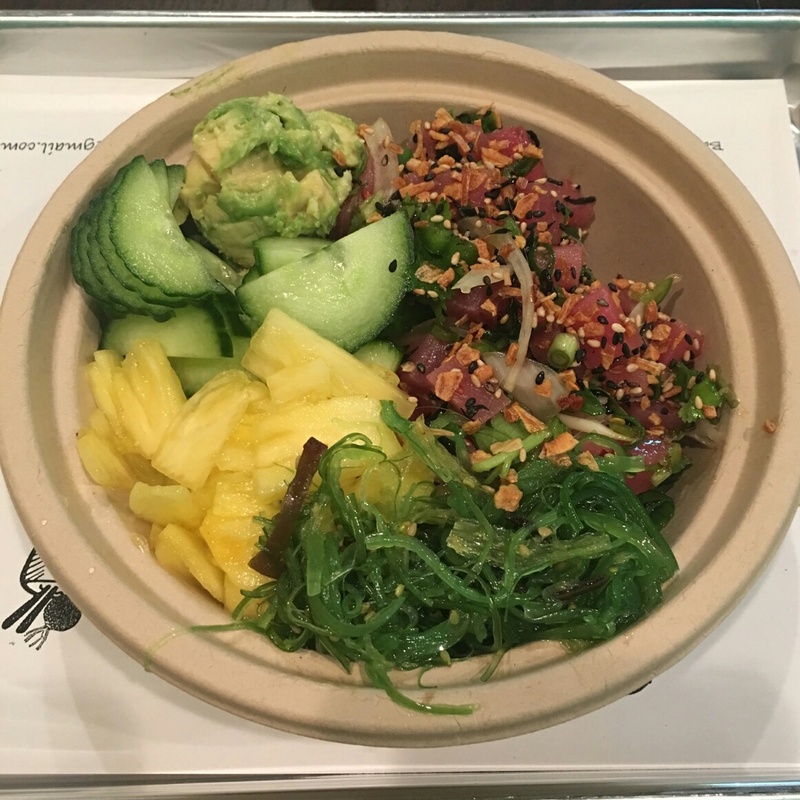 After I ordered, my wife picked her meal, going with the small Hawaiian Original with tuna, sweet onion, green onion, chili flakes, sesame oil, seaweed, and Hawaiian sea salt. Our friend took the large Gyudon Beef – thinly sliced beef cooked with onions in a sake shoyu sauce over rice. They had the opportunity to get mix ins, toppings, and crunch on theirs too. Throughout the process of the bowls being created, what stood out to me was that they were pretty large. Even the small bowl was fairly sizable. While the additions beyond the protein and sauce were distributed in small-ish amounts, the bowl was already relatively full before those went in and we were able to choose as many as we wanted. We paid and found a table to sit at. I asked where the silverware was located and was pointed to a small counter where I also found napkins, gluten free soy sauce and sriracha. I decided to take a little cup of the spicy red stuff, but didn’t need any soy since I figured my shoyu would cover that. The first moments after sitting were reserved for inspecting my bowl and the others at the table. Everyone had created masterpieces. My wife said the tuna was very fresh and our friend commented that the beef was tasty. I started eating by trying my toppings. I particularly enjoyed the seaweed salad. Next, I wanted to try the proteins. The tofu wasn’t bad, but was easily made better with a little sriracha supplement. The beef was excellent, taking on the flavor of the shoyu sauce it was cooked with. It was part soy and part sweet spice, which I found to be really nice. Lastly, I tried the chicken which was crunchy and breaded. My first bite was stunning. The chicken had a sweet flavor that was just outstanding, filling my senses and besting even the taste of the beef. I was sold. The bowl was particularly enjoyable as I got to more and more of it. The rice and sauce complimented each other spectacularly, the jalapeno added a slight additional heat, and the wasabi peas were a nice addition. The crispy garlic and onions bits went a long way, adding much more umph than I expected. With its many parts, it was easy to forget everything I had on there until I tasted it, but it all seemed to work together in a way which made the meal fun and a nice change of pace from the table service restaurants I often visit. The meals at BFP are $10.99 or $13.99 depending on whether you order a small or a large. I found the large to be sufficient for someone who was quite hungry. The food was super fresh and that will undoubtedly be the key to their success long term. With raw fish and vegetables in particular, it will be a necessity, but that seems to be what they’re all about. If they keep doing it up, the positive reviews and steady business will almost certainly continue. 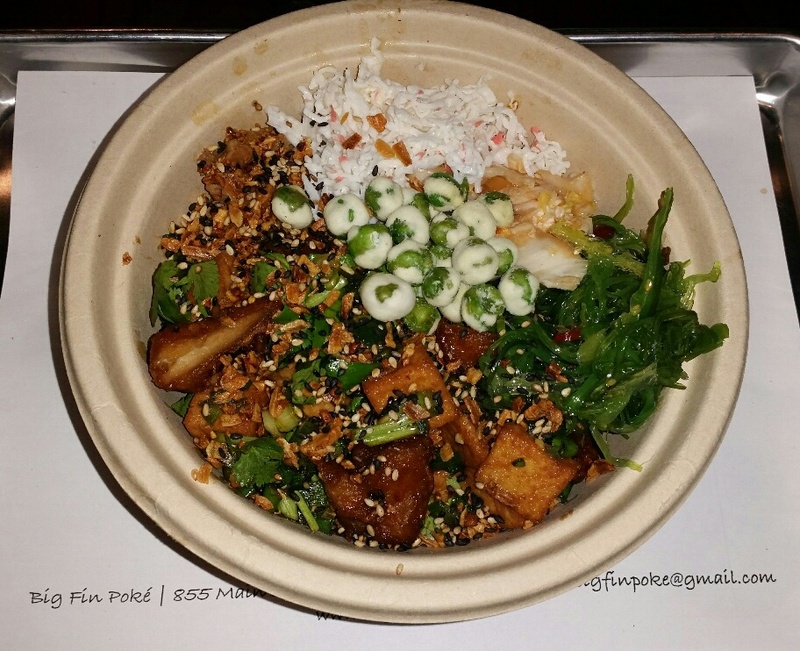 If you’re looking for something a little healthier, a bit outside the usual, and just, plain yummy concoctions, consider Big Fin Poke and enjoy food that will make you feel like you’ve done something good for yourself. This entry was posted in Portland, ME food on February 2, 2017 by peterpeterportlandeater.